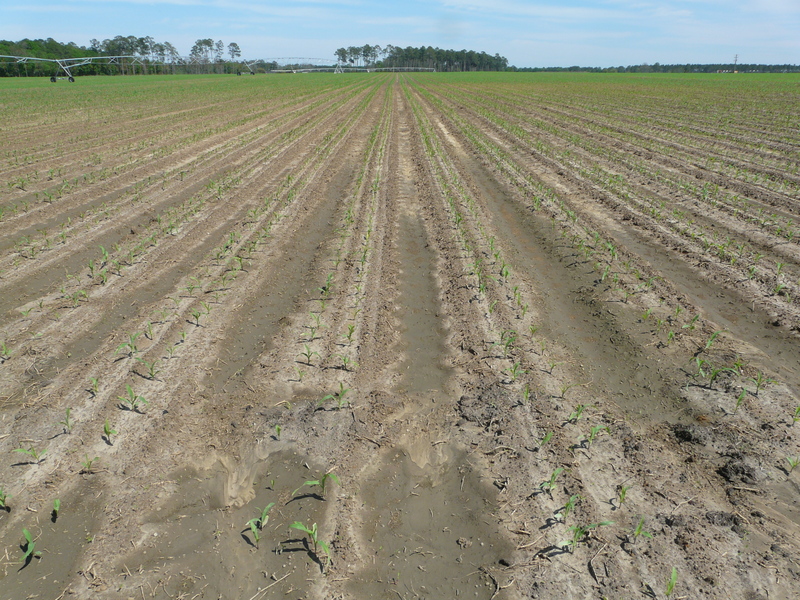 Here is some of our earliest planted corn in the northeast part of the county. This corn is planted twin row at 8 inches. Much of the corn is in the seedling stage with one or two leaves. But the oldest of this corn at v3. At this growth stage, the first three leaves are collared. This is how we tell our growth stage. 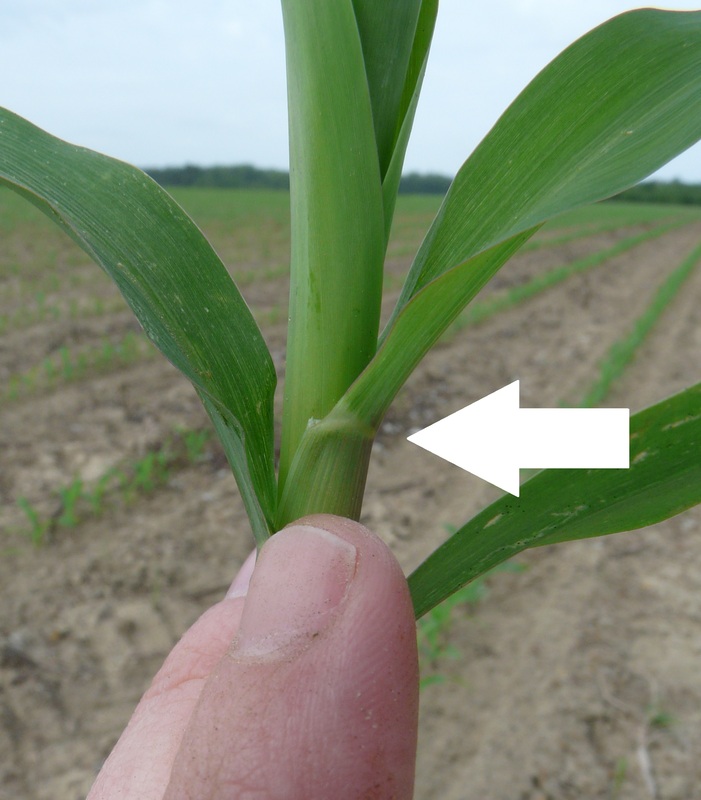 Look for the collar on the back of the leaf sheath. All leaves are initiated at the growing point, which is still below ground. This is more important early on if temperatures were to drop. The photo on the right shows the collar. 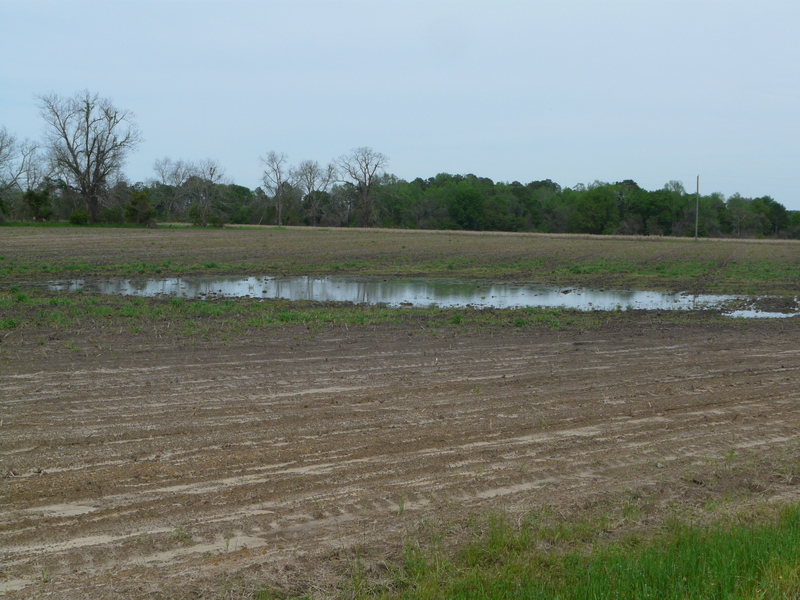 At this point, corn is using 0.07 – 0.09 inches of water per day. This is between 13 and 22 days after planting. 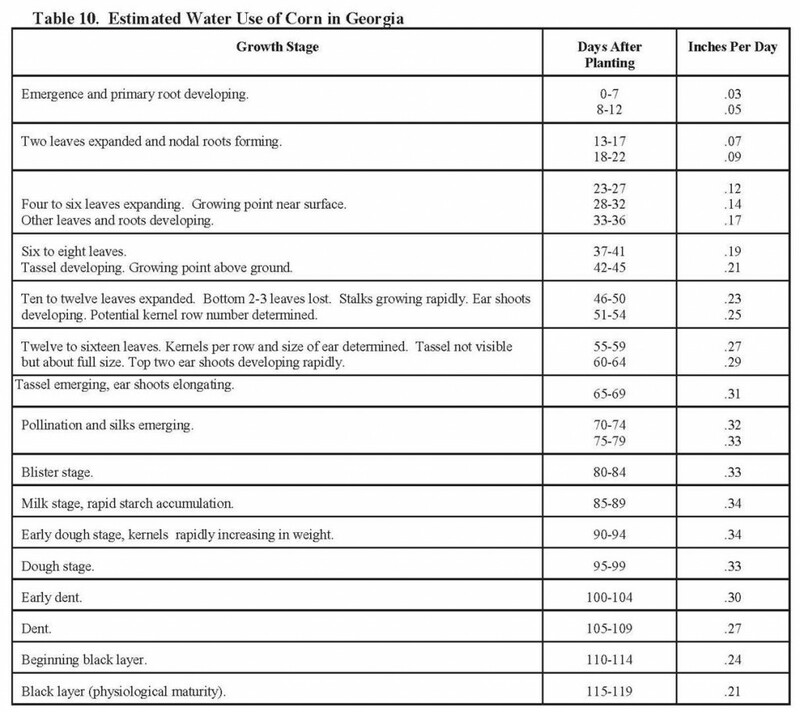 Here is a table from the UGA Corn Production Guide showing the irrigation scheduling through checkbook method. *We need 15 – 20 samples at each stage. We have not been able to get in the field this week with rain last weekend. I’ve driven on a pasture and around woods edge making calls the last two days, and you can still hear the water under the tires. With projected rain coming, it’ll be another few days before fields dry out. We had a good sunny day yesterday, but it takes a few sunny days to dry things out. Some reports of rain 5 inches. Here is picture from yesterday. 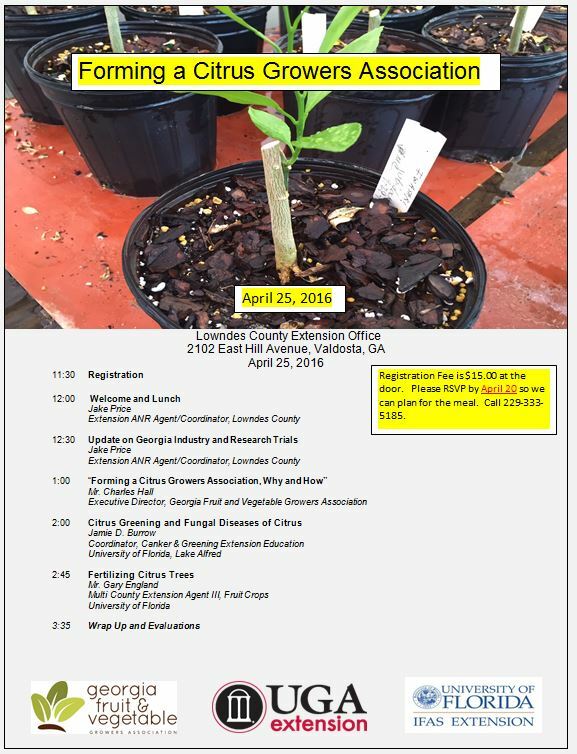 Lowndes County Agent Jake Price has put together another citrus program for Monday, April 25th at the Lowndes County Extension Office. The main topic of discussion is forming a citrus growers association. There will be a $15 registration for a meal, so RSVP by April 20th. Bud break of pecan has arrived in south Georgia. If you have problems with phylloxera, UGA Extension Pecan Horticulturalist Dr. Lenny Wells says it is time to consider making an application for this pest. The southern pecan leaf phylloxera, is a tiny aphid-like insect that feeds on the foliage of pecan trees. The insects are rarely seen, but the galls that they cause are prominent. The southern pecan leaf phylloxera is primarily a pest on mature pecan trees, but it can be found on nursery and young trees. Some products are taken up by the plant systemically, and this may provide an easier control option. Last season, we put out a trial to test drenching Admire at different times. After rating, we found no difference in drenching from December through March. We are thinking of other ways to test this theory. Until then, foliar spraying is our best option. The timing is critical. Overwintering eggs hatch beginning the first week of April and continue until the first of May. The newly hatched stem mothers crawl to the expanding leaves where they settle down and begin feeding. Feeding causes rapidly growing gall tissue which encloses the immature stem mother within a few days. 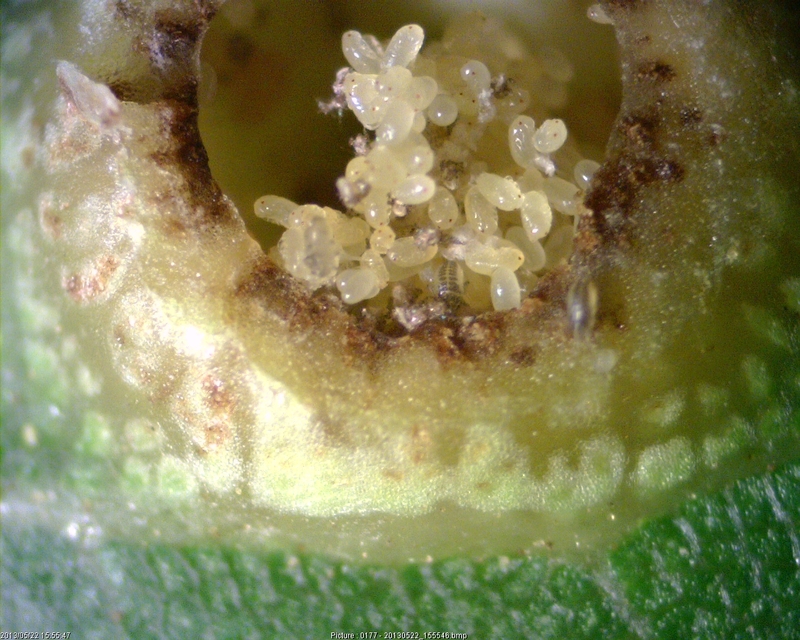 Stem mothers mature by mid-April at which time they lay eggs within the gall. Light populations are most probably of little consequence. However, each gall results in dead leaf tissue and numerous galls can cause premature leaf shedding. Hickory shuckworm uses phylloxera galls for first generation larval food. Of much greater concern than leaf phylloxera, a separate species, stem phylloxera can be much more damaging. 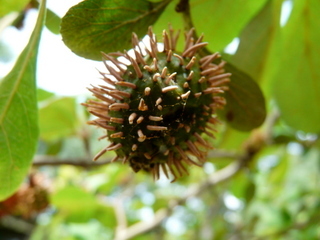 They produce a hard swelling or tumor like galls, one tenth to one inch in diameter on leaves, leafstalks, succulent shoots, catkins, and nuts of new growth. 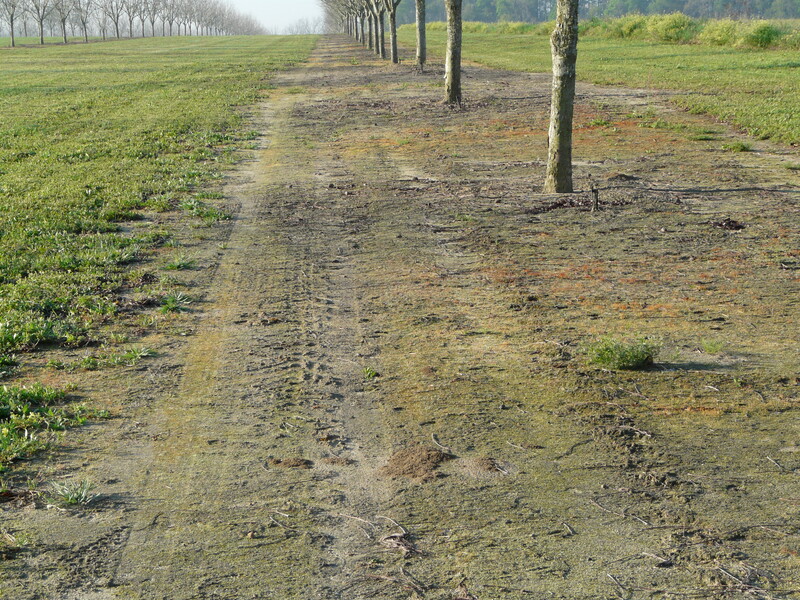 Heavy infestations can completely destroy an entire nut crop and the accompanying malformed and weakened, infested shoots reduce tree vitality to such an extent that damage may reduce the following years production. This is rarely seen in managed orchards but where it does occur it needs attention. Imidacloprid is a good, inexpensive, systemic choice for phylloxera control. Phylloxera sprays should be applied just after bud break or no later than when the leaves are one-third grown. Once galls are observed it is too late to spray until next year. Hay that is stored outside will go through times when it will get wet and then dry out. It will subsequently develop a fibrous, weathered layer. When forages go through the wetting and drying process, nutrients are leached out. This causes the fiber component of the forage to represent a larger proportion of the dry weight. Table 1 (below) shows the changes in digestibility and crude protein of a grass and a grass-legume mixed forage when it is weathered and not weathered. This experiment shows that weathering causes TDN to decrease while the crude protein increases in both the grass and grass legume mix. Carbohydrates often leach out, but protein does not. So, weathering decreases digestibility and, by difference, the protein is a greater proportion (i.e., the percentage increases). Table 2 shows the typical ranges of storage losses for various hay storage methods that include pole barns, hoop structures, and outside storage. This experiment also evaluates how baling the hay with twine or net wrap affects storage. When the hay is stored under a pole barn or hoop structure, dry matter losses range from 2 to 5%. Dry matter losses from outside storage ranged from 20 to 60%. 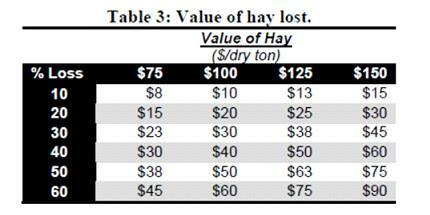 Table 3 shows the value of hay lost based off the percent of forage lost and how much dry matter per ton the hay is valued. For example, if hay is valued at $100 per ton on a dry matter basis, and we experience 30 percent loss, then there is a $30 per ton loss forage. That is a lot considering the investment in fertilizer, lime, pesticides, etc. that is required in hay production. If hay must be stored outside, it should be stored in a sunny location. Hay should never be stored under trees where air circulation is questionable. Bale rows should run north and south instead of east to west. Hay growers should place the flat ends of round bales together and the rounded sides should not touch. Hay rows should be at least 3 feet apart to help with air circulation. Having well-formed, tight bales can help hay growers reduce storage loses. A minimum of 10 pounds of hay per cubic foot is recommended for outside hay storage. A denser bale will resist water infiltration which will cut down on weathering. In order to make a denser bale, hay growers need to be aware of baling at safe moisture levels. This is because a more dense bale can reduce the amount of moisture and heat that escapes. Soil contact of hay bales is an issue with outside storage. Research data shows that around 50% or more outside storage losses occur due to hay having contact with soil. Hay growers reduce storage losses by placing their crop on a rock pad, concrete or wooden pallets. If this is not possible, then look for well drained areas. Growers can place bales on a slope that allows water to drain away from the hay. Bales should be placed up and down the slope to minimize water flowing around the hay. If a hay producer has an open sided barn, then it should be oriented with the long axis east and west to minimize the exposure to sun light. If one side of the hay barn is open, then face it away from the prevailing wind which would generally be on the south side. This would minimize rain exposure of the hay being stored. Buildings for hay storage need to be open at the peak of the roof to allow moisture to escape as the hay dries. If the gables are closed, condensation and rust will occur inside the roof. More hay can be stored in a barn if you stack the bales on the flat end rather on the round side. Also consider the addition of side walls so the facility can be used for both equipment storage and hay. Glufosinate and Paraquat would be better selections for burndown than glyphosate under newly planted and young trees because they are contact materials and any potential drift would cause very limited and only temporary damage unlike the systemic glyphosate. Just be sure to protect the bark from any herbicide. Burn down herbicides should include glyphosate where grass is a major issue. Just be careful about drift where using this material under young trees. Paraquat and Glufosinate normally will not give long term control on a thick covering of Bermuda grass. Include pre-emergent herbicides in your program. Again, we have many options here. Alion is an excellent pre-emergence material that gives long lasting control. It has a high price tag, but will significantly cut down on the number of applications you need to make, which offsets the cost. Use the 5 oz/A rate in the first year that you use Alion. After that, you can drop down to the 3.5 oz/A rate. Previously Alion was only labeled for trees 3 yrs of age or older. I was recently told by Bayer representatives that this has changed and can be used on 1st year trees and older. We have tested it for a number of years on 1st year trees at high rates and have never seen a problem. Flumioxazin (Chateau) is also an excellent pre-emergence herbicide for use on trees 1 year and up. Its residual is not quite as long as Alion, but it’s close. 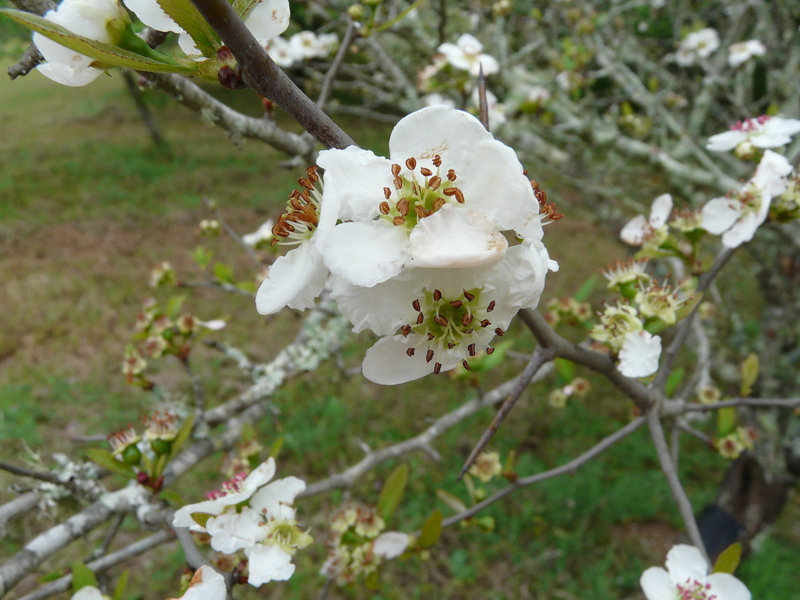 Even if you are using Alion, rotation between Alion and Flumioxazin from one year to the next is a good idea to manage resistance and limit the over-use and buildup of indaziflam (Alion) in the orchard. 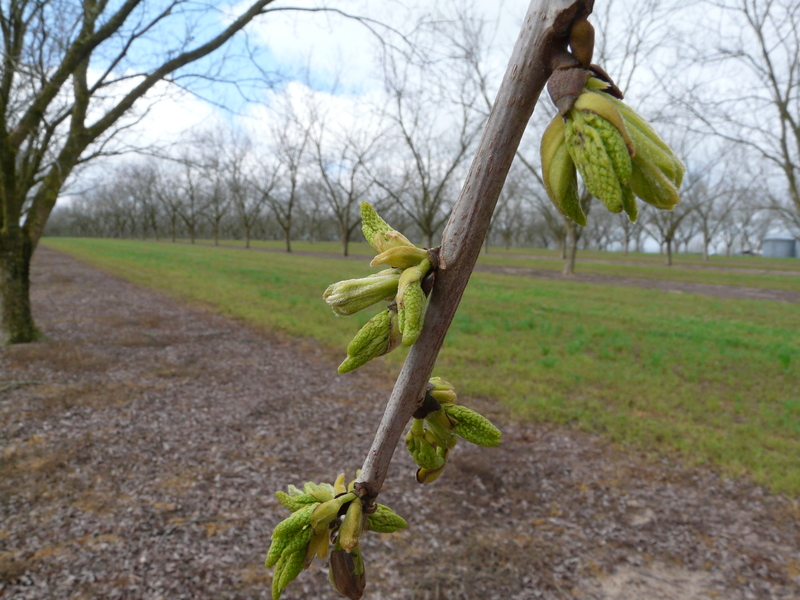 We have many other options for pre-emergence which can be utilized in pecan orchards. These include Surflan, Simazine, Prowl, and Diuron. Isoxaben (Trellis) and rimsulfuron (Metric, Solida, and Pruvin) are recent additions to this arsenal. Of these, Surflan, Prowl, Isoxaben and Rimsulfuron can be used on 1st year trees and up. Trees must be 2 yrs old for Simazine and 3 years old for Diuron. Also, do not use Diuron on sandy soils. Consult the current UGA Pecan Spray guide here for a complete list of herbicides available for pecan and their uses. 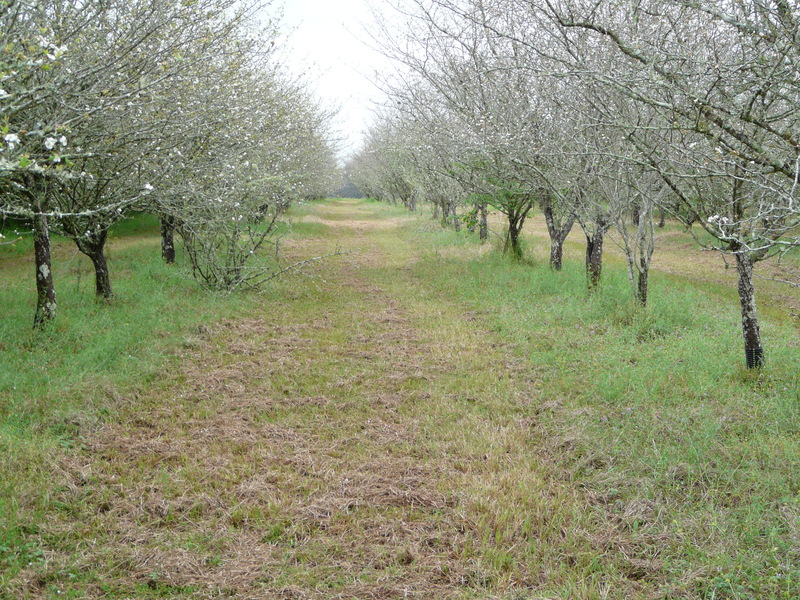 Tank mixing burndown and pre-emergent herbicides will reduce the number of trips made over the orchard but be sure to have at least 75-80% bare ground when using a pre-emergence material. Most of them need good soil contact to be effective. Mayhaws are blooming in the county right now. For years, they have been used in the Deep South for cooking. Many folks around make jelly from Mayhaws. Last year, their prices went up and folks were interested in finding trees. Though mayhaws grow well in low areas, like river bottoms, they are also adapted to commercial production and grow good on upland sites with irrigation. One of the biggest pest issues we have with mayhaws is a disease called Quince-Cedar Rust. Spores infect the tree at bloom each year and then overwinters on a secondary host of a cedar tree – usually Eastern Red Cedar – after this. Infection takes place one time during the growing season. The first thing to do is remove cedar trees within a quarter of a mile of any mayhaws. If many cedar trees are present, this is not practical. In this case, managing rust with a fungicide program is the best option. UGA Extension Pathologist, Dr. Elizabeth Little, says that myclobutanil is labeled for this disease and can be applied starting at bloom if this disease has been a problem. Be aware that resistance is common with myclobutanil so the further apart your sprays the better. Spray with myclobutanil no more than two times in the growing season. Another fungicide may need to be used following these treatments. Below is a picture of Cedar-Quince Rust.